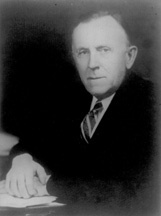 BULOW, William John, a Senator from South Dakota; born on a farm near Moscow, Clermont County, Ohio, January 13, 1869; attended the public schools in Moscow, Ohio, and graduated from the law department of the University of Michigan at Ann Arbor in 1893; admitted to the bar the same year and commenced practice in Beresford, Union County, S.Dak., in 1894; member, State senate 1899; served as city attorney of Beresford, S.Dak., 1902-1912 and 1913-1927; mayor of Beresford 1912-1913; county judge of Union County, S.Dak., 1918; Governor of South Dakota 1927-1931; elected as a Democrat to the United States Senate in 1930; reelected in 1936 and served from March 4, 1931, to January 3, 1943; unsuccessful candidate for renomination in 1942; chairman, Committee on the Civil Service (Seventy-third through Seventy-seventh Congresses); retired and resided in Washington, D.C., until his death there on February 26, 1960; interment in St. Johns Catholic Cemetery, Beresford, S.Dak. Pressler, Larry. William J. Bulow. In U.S. Senators from the Prairie, pp. 97-106. Vermillion, SD: Dakota Press, 1982.